Russian President Vladimir Putin has signed into law a ban on Americans adopting Russian orphans. The law is a reaction to the US Magnitsky Act, which blacklists Russian officials accused of rights abuses. The death of anti-corruption lawyer Sergei Magnitsky in 2009 became a symbol of the fight against corruption in Russia, and soured relations between Russia and the US. The US state department says it "deeply regrets" the passing of the law. 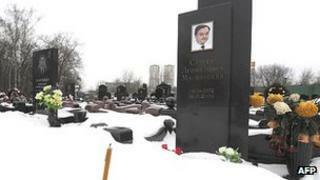 On Friday, a Moscow court acquitted a prison doctor accused of negligence over Magnitsky's death. It was the only trial to be held in the case. The judge said Dmitry Kratov had acted appropriately when Magnitsky fell ill in jail. Mr Kratov was deputy head of the high-security Butyrka prison in Moscow at the time. A Russian official report last year concluded that Magnitsky had been tortured and handcuffed in jail. Magnitsky represented London-based Hermitage Capital Management (HCM). He uncovered what he described as a web of corruption involving Russian tax officials, including the alleged theft of more than $200m (£125m). After reporting it to the authorities, he was himself detained on suspicion of aiding tax evasion, and died in custody on 16 November 2009 at the age of 37. US-born fund manager Bill Browder, who runs Hermitage Capital, spearheaded efforts in the US to put pressure on Russia over the Magnitsky case. Mr Browder was a major investor in Russia before Magnitsky's arrest. Earlier this month the US Congress adopted the Magnitsky Act, prompting Russia's retaliation. The EU has also criticised Russia over its handling of the case. Mr Putin signed the Russian law after it had been approved by the Russian parliament. He told officials he saw no reason not to sign it, and said he would sign a presidential decree to "modify the support mechanisms for orphaned children". "There are lots of places in the world where living standards are higher than they are here," Mr Putin said. "Are we going to send all our children there? Perhaps we should move there ourselves?" Some 3,400 Russian children were adopted by foreign families in 2011, almost one-third of the children going to American homes. Over the same period, the number of children adopted by Russian citizens was 7,416. In the past two decades Americans have adopted more than 60,000 Russian children. "The Russian government's politically motivated decision will reduce adoption possibilities for children who are now under institutional care," US state department spokesman Patrick Ventrell said. "We are further concerned about statements that adoptions already underway may be stopped and hope that the Russian government would allow those children who have already met and bonded with their future parents to finish the necessary legal procedures so that they can join their families," he added. The Moscow judge ruled on Friday that Mr Kratov had organised Magnitsky's transfer to hospital and had "taken all the necessary measures to treat the illnesses" that Magnitsky was suffering from. Magnitsky had pancreatitis, but an investigation by Russia's presidential council on human rights concluded that he had been severely beaten and denied medical treatment. The council's report, compiled while Dmitry Medvedev was president, singled out senior interior ministry investigator Oleg Silchenko and prison chief Ivan Prokopenko as being at fault for neglect over the lawyer's death. The document said they "obstructed" his medical care by moving him to another prison just before he was due to have an operation, where there was a criminal failure to provide him with care in the last days of his life. Magnitsky's mother, widow and lawyers believe that Mr Kratov has been used as a decoy by the authorities to protect the real culprits in the lawyer's death. Mr Kratov's assistant Larisa Litvinova had also been a suspect in the case, but the investigation into her actions was dropped in April.